This award honors companies with superior achievement among plastics processors. Petoskey, MI: Petoskey Plastics was named one of four finalists for the Plastics News Processor of the Year Award for 2017, which is sponsored by the Plastics Industry Association. Plastics News announced the finalists in their January 8th edition. Petoskey Plastics was named a finalist in 2016 as well and is once again the only blown film company among the finalists. 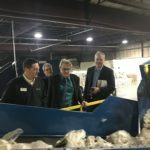 Petoskey Plastics hosted Plastics News editor Donald Loepp and senior reporter Bill Bregar at their Hartford City, Indiana plant on January 11th for the final round of the Processor of the Year selection process to show the recycling lines and newest technology. The winner will be announced on March 7th at the Plastics News Executive Forum in Naples, FL. Petoskey Plastics is an environmentally focused recycler and plastic film, bag and resin manufacturer providing superior products and solutions. Headquartered in Petoskey, Michigan, the company provides products and engineered solutions for a variety of industries including automotive, industrial, institutional, retail, construction and home improvement. Petoskey Plastics has facilities in Michigan, Indiana and Tennessee. Learn more at www.petoskeyplastics.com. Plastics News Bill Bregar, award coordinator and senior reporter, editor Don Loepp and Petoskey Plastics’ Jason Withers and Steve Schmidt look at the recycling line. 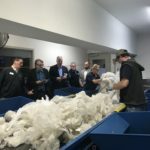 (from left) Jason Withers, Bill Bregar, Don Loepp, Steve Schmidt, plant manager, and Mike Holifield, Director of Operations. Sorters are Linda Hamaker and Nathan Downhour. Plastics News editor Don Loepp interviews Petoskey Plastics’ production shift managers, Tonya Withers. 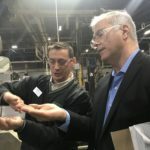 Plastics News editor Don Loepp, looks at recycled resin with Petoskey Plastics’ recycle department manager, Jason Withers.